A great idea for a business sometimes comes from personal experience. Such was the case for us, Rita McArthur and Colleen Armstrong, friends/ owners of Intrigue Lingerie. It is estimated that 80% of all women are wearing the wrong size bra and correcting that takes a proper fitting and a quality product. Once we were properly fitted for a bra at a boutique in New York City, we wanted the women in Lethbridge to have the opportunity to have the same experience. We got tired of having to travel out of town to find the right bra with the right fit. We opened our doors in May of 2008. Since then, we have experimented with styles and size assortments and that history has helped us to understand just what Lethbridge and area women are looking for. With over 4,000 bras currently in stock, ranging in size from 28 – 54 Band Width and AA to L cup sizes, there is something for every woman. 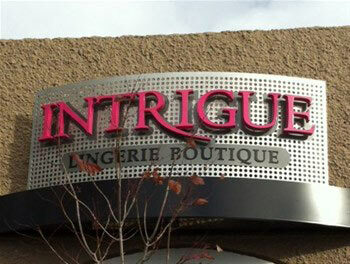 Why should you shop at Intrigue Lingerie Boutique? Because our goal is to ensure that every woman who shops in our store is provided with a comfortable, relaxing and knowledgeable experience while shopping for her intimate apparel. With our wide range of manufactures, styles and sizes, coupled with our fitting expertise we strive to increase any women’s confidence and comfort in the lingerie they are wearing. Our customers can’t believe the difference a properly fitted bra makes and most leave feeling like a new woman. And what could be better for a woman’s self-esteem than that. Intrigue Lingerie also carries a beautiful assortment of: sleepwear, loungewear, nursing bras, sports bras and accessories. Fittings take place in the privacy of the well-appointed dressings rooms and you will love how comfortable, confident and different you feel and look. Bring in any dress and the staff will make sure the style and color totally flatter the outfit. A fitting at Intrigue Lingerie is a painless and liberating experience that every woman should have.